So far in this “Who Did We Get?” series, we’ve covered the two top hitters the Yankees received as part of their bounty of prospects over the last couple of weeks. As we all know, it’s pitching and defense that are the real keys to winning championships, though. Don’t fret, my pet, the Yankees got plenty of arms back in these deals too. As far as pitching goes, the Yankees have some guys lined up in the system that could do some real damage at the big league level some day. Luis Severino no longer qualifies as a prospect, but he’s a huge part of the team’s future. 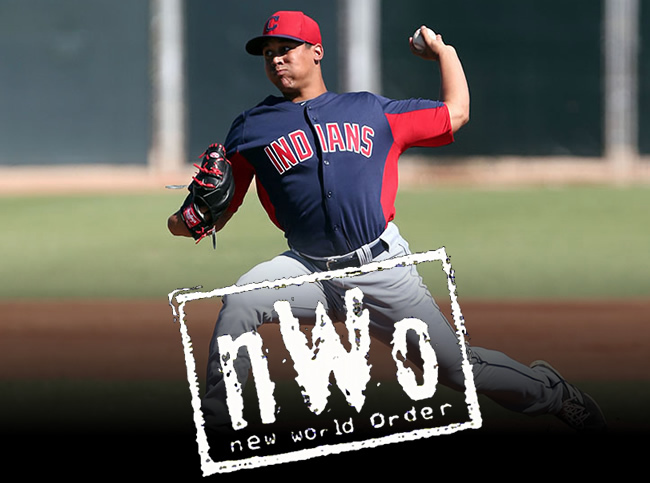 Today’s “Who Did We Get?” subject, Justus Sheffield (7) headlines a group of arms that includes eleven of the team’s top 30 prospects. The other ten are Domingo Acevedo (9), James Kaprielian (10), Chance Adams (13), Ian Clarkin (17), Drew Finley (18), Jordan Montgomery (19), Jacob Lindgren (20), Chad Green (21) and Dietrich Enns (26). If the Yankees are going to rebuild this franchise, young pitching will be a key, and Justus Sheffield, who came over from the Indians along with Ben Heller, P.J. Feyereisen and Clint Frazier in exchange for Andrew Miller, could be one of those guys the fans end up feeling great about every fifth day. Let’s get to know him! It’s been far too long since the Yankees have had a Sheffield on the field, don’t you think? No, Justus isn’t related to former Yankee outfielder Gary Sheffield, nor is he related to Dwight Gooden, as Gary is, but I’ll pretend he is with you guys if you want me to. The main things to know about this kid is that he was the 31st overall pick in the 2014 draft out of Tullahoma High School (Tullahoma, TN), is just 20 years old and throws with his left arm. While left-handed people are usually mocked until my throat is sore in the real world (sorry, El Bolso), in baseball, they are very valuable–specially as pitchers. Have left arm dominance, will travel, right? Remember Jamie Moyer? He pitched until he was 50 and threw 35 mph, but people kept signing him because he was left-handed and crafty. There are three guarantees in life: taxes, death and left-handed lust in major league baseball. But, I digress… Lucky for us, Justus is actually a very talented lefty, who shouldn’t need to be crafty to get guys out until he’s that 38-year-old former All-Star the Yankees are paying $25 million dollars a year to well past the time when he’s actually worth it…. hypothetically speaking, of course. Sheffield shows the makings of an above-average three-pitch mix. He’s hitting 96 mph with his fastball, but usually sits in the 92-93 mph range with late, arm-side life and some sink. His curveball flashes plus and projects as a swing-and-miss offering at the highest level, and he made strides in developing his changeup in 2015. A good athlete with a clean and repeatable delivery, Sheffield has battled control in Class A Advanced and needs to improve the quality of his strikes. At 5-foot-10, Sheffield is somewhat undersized, but still creates good downhill plane toward the plate and keeps the ball in the yard. Both his secondary pitches and his command require further refinement, but the southpaw has all the tools necessary to develop into a quality mid-rotation starting pitcher. All of that is good enough to put Sheffield in the top 100 MLB Pipeline prospects in all of baseball–one of seven Yankees now able to boast that claim. Sheffield has the heater and the strikeout pitch in development that, at the very least, would make him a great reliever at the big league level. Thankfully, it looks like his secondary offerings are coming along nicely as well, as you can see by the fact that he’s projected as a middle-of-the-rotation type of guy. I know I mentioned earlier that he doesn’t yet need to be crafty, but Justus has actually been getting a leg up on the latter part of his career (pun very much intended). According to Quinn Barry of SB Nation, his delivery includes a tiny hitch where he raises his right leg slowly before quickly extending it as far as possible and delivering the pitch. Sounds to me like practically crane kicking his way through his windup, and that might just help him become the best around, or at the very least, the man who will fight for our honor. In all seriousness, the leg kick helps throw off the timing of opposing hitters, making his fastball seem faster than it is and adding to the deception of his breaking pitches. Crafty! As far as his size goes, you can see that Justus isn’t the biggest dog in the fight. You know who else isn’t very big? Johnny Cueto. You know who is a giant? CC Sabathia. Which of those two would you rather have in your rotation right now? Unless you’re me picking wide receivers in a Madden draft, you’re probably gonna go for the better guy, and not the taller guy. The one concern the Yankees should have with Sheffield is his control. Through 243.1 minor league innings, the southpaw has 87 walks (3.8 BB/9), and that’s simply just too high. That being said, he’s only 20 years old, and most pitchers his age are still struggling to figure out which shoe goes on which foot, let alone how to hit a 17-inch dish from 60 feet away. There’s still plenty of time for him to right his control problems, and the Yankees have a pretty decent staff of coaches down in Tampa who will do their best to help him repeat his delivery efficiently and locate his pitches better. If he’s still walking 4 guys per 9 when he’s 23 or 24, then I’ll worry. Despite being relatively young for the league in which he is pitching–he’s actually more advanced than his older brother, Jordan Sheffield, who is currently in the Dodgers system–Sheffield has more than held his own during his climb towards the big leagues. In those 243.1 innings, he has a 3.59 ERA (3.79 FIP), and he has struck out more than one batter per inning (260 overall) using those nasty Uncle Charlies down in the zone. The key with young Justus is going to be whether he can fulfill his projections and make the adjustments that every player has to make in order to succeed in the big leagues. Pipeline has him fitted for pinstripes sometime during the 2018 season, which would make him just 22 years old. Can he be the solid middle-of-the-rotation arm to take the ball in Game 3 of the 2021 World Series? Only time will tell.